Everyone loves bibimbap, especially dolsot bibimbap, which is a rice dish with various vegetables and optionally meat in a sizzling stone bowl. 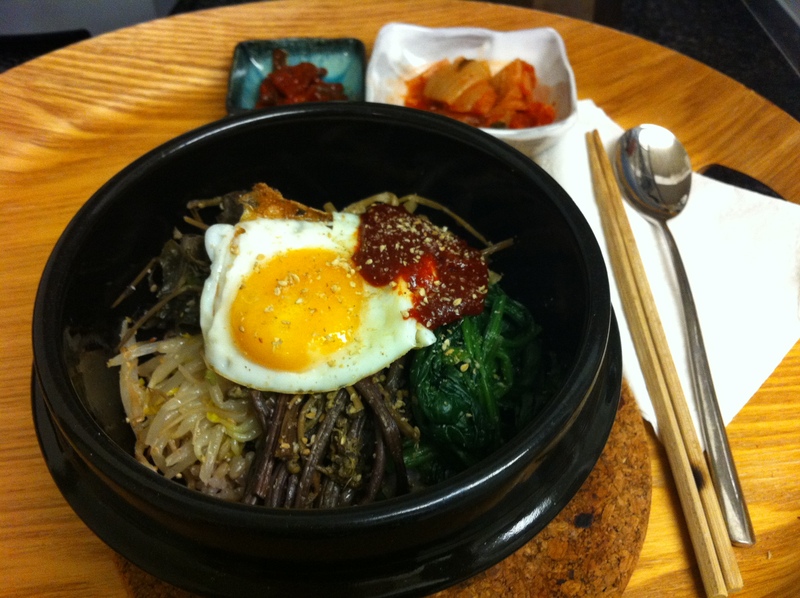 Bibimbap has become Korea’s most well-known dish along with Kimchi and bulgogi. When I have various namuls, which are marinated vegetables, in the refrigerator, I always make bibimbap simply by placing a serving of rice and placing different namuls on top. This nutritious one pot meal only takes about 5-10 minutes. You can add any variety of namuls, Kimchi if you like and additionally add marinated meat such as bulgogi. The options are limitless. I like to add a fried egg on top with a sprinkle of crushed gim (김, seasoned seaweed). If you would like a vegetarian version, simply omit the egg and meat. 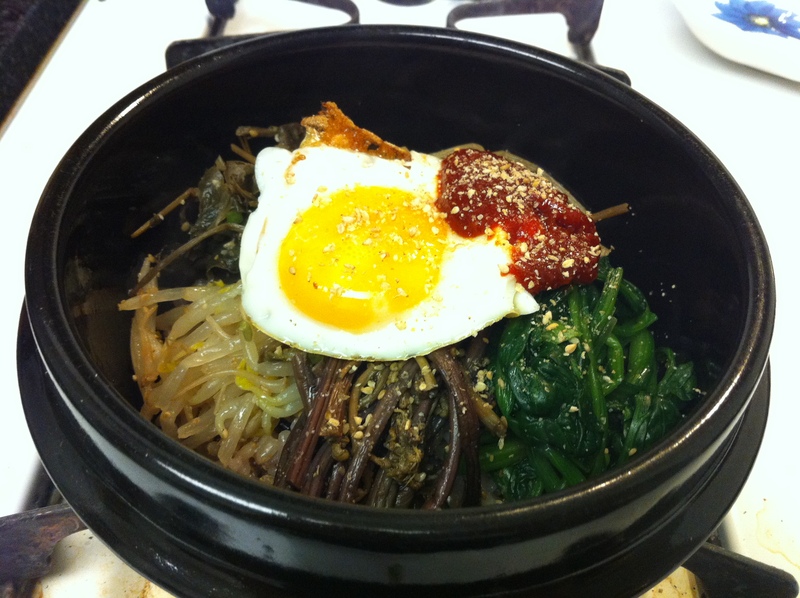 If you want to make a dolsot bibimbap, make the bibimbap in a ttuckbaegi (뚝배기), which is a Korean earthenware pot. As I mentioned in earlier posts, ttuckbaegi is a must have for Korean cooks to make any kind of jjigaes like duenjang-jjigae, kimchi-jjigae and ttuckbaegi-gyeranjjim. You can find this affordable pot in any Korean market. 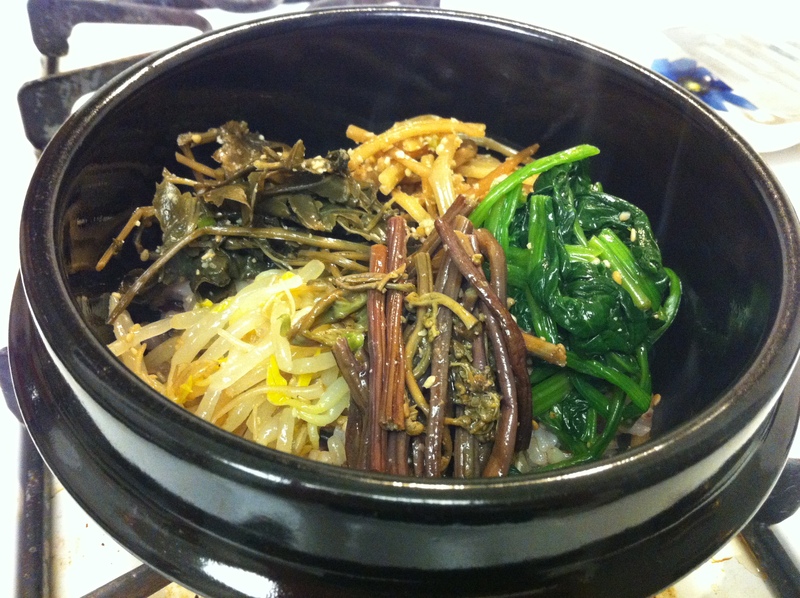 Drizzle a tablespoon of sesame oil in a ttuckbaegi (뚝배기, Korean earthenware pot) if you are making dolsot bibimbap. Spread the sesame oil evenly around the inner surface of the pot with a small piece of paper towel. Heat the ttuckbaegi on medium-high heat. Place a serving a hot cooked rice in the center and add various namuls on top in a circle. You can add kimchi or marinated cooked meat, such as bulgogi. Top the bibimbap with a fried egg, gochujang (고추장), a sprinkle of crushed gim (김) and toasted sesame seeds. Take ttuckbaegi off the heat after about 10-15 minutes when the bottom of the rice is crunchy but not burnt. This entry was posted in Good for dinner, Good for lunch, Rice Dish, Vegan/Vegetarian Options and tagged Bibimbap, Namul by gangnamkitchen. Bookmark the permalink.